Meet the Veterinarians & Team of Daleville Animal Hospital in Daleville! We’re pleased to provide exceptional vet care for your pets! Please call us at (334) 598-1117 to speak to one of our caring veterinary staff members! Christa Parrish-Ahrens, DVM is our new Partner Owner of Daleville Animal Hospital. Dr. Parrish-Ahrens is a practicing clinician and surgeon at our Hospital, and also helps oversee the operations, procedures and medical care of the practice. 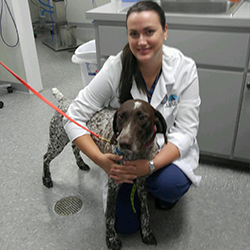 She has been practicing Veterinary Medicine for 12+ years, with experience in both small and large animal medicine and surgery, emergency medicine and surgery, and practice management. Double alumni from Auburn University, Christa received her Doctorate of Veterinary Medicine from Auburn University’s College of Veterinary Medicine in 2005 and also received her Bachelor’s of Science Degree in Animal and Dairy Science from Auburn University’s College of Agriculture in 2001. Always focused on providing exceptional veterinary medical care for her patients, Dr. Parrish-Ahrens’s vision for Daleville Animal Hospital is to continue to expand the practice so that we are always able to provide the best and most updated medical care for our community’s pets. Dr. Christa enjoys horseback riding, hunting, being in the great outdoors on the land and spending time with her husband and 3 children. She is married to Kristopher Ahrens, a retired Army Aviator, and they have twins and an older son together.